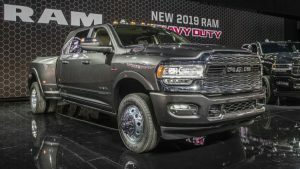 Toronto, Ontario: Ram Truck unveiled the new 2019 Ram Heavy Duty with a long list of upgrades, the new Cummins 6.7-litre High Output Turbo Diesel delivers up to 1,000 lb.-ft. of torque @ 1,800 rpm and 400 horsepower @ 2,800 rpm. The second variant of the Cummins Turbo Diesel also gets a performance boost with 370 horsepower @ 2,800 rpm and 850 lb.-ft. of torque @ 1,700 rpm. The 2019 Ram Heavy Duty with V-8 engine also uses an innovative rotary e-shift dial mounted on instrument panel’s center stack – freeing up space traditionally occupied by a console- or column-mounted shift lever. A class-exclusive Active-Level rear air suspension is available on both the Ram 2500 and Ram 3500 and includes a new Bed-lowering Mode to make the heaviest trailer hook-ups a breeze. New for 2019, RamBox features a 115-volt outlet with up to 400 watts of power.